by Don Troiani. Hardbound, 264 pages, 9" x 12". 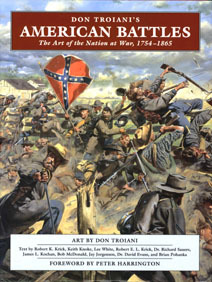 In this panoramic tour of America's military past, acclaimed artist Don Troiani once again turns his brush to the wars of the 18th and 19th centuries. From the French & Indian War through the Civil War, Troiani brings his flair for detail and high drama to such famous battle scenes as Bushy Run, Bunker Hill, Cowpens, Antietam, Gettysburg and Chickamauga. Lavishly illustrated with full-color artwork. 172 paintings, 53 color photographs, 11 black & white photos.